The Reds are awful. They can’t hit and they can’t pitch. Worse, they make more mental mistakes than a t-ball team. They’re 7-11, and being outscored 82-112, they’ve actually won more than they “should” have. 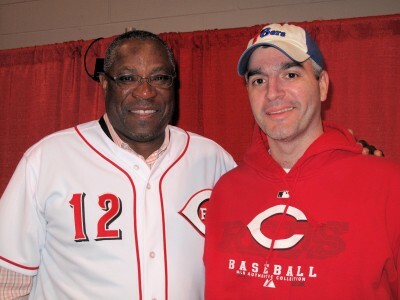 Everybody wants to blame manager Dusty Baker. That’s too easy. I’m going to place the blame for this lousy start at the feet of one man: Miguel Jesus Cairo. Unfortunately, Cairo hasn’t been able to turn the Reds into the 2009 Phillies. Instead, he’s doing what he did to the 2008 Mariners (61-101). Maybe “proven winner” only works in odd-numbered seasons. Perhaps I’ve been too harsh. Cairo (like Scott Rolen, Ramon Hernandez, and Orlando Cabrera) has totally failed to “turn the Reds into winners.” But Cairo has done the job Jocketty promised – coaching young bench players. Young(-ish) benchwarmers Ryan Hanigan (1210 OPS) and Paul Janish 1127) are the only guys on the roster carrying their weight. I take it all back. Miguel Cairo is one of the very few guys on the roster hitting a lick. His job is “overpaid coach wasting a roster spot,” but at least he’s doing it. I am so sick and tired of hearing crap like ‘proven winner’. You know what wins in baseball? Talent. You know what doesn’t at all? ‘Winners’. Give me a jerk who can play defense, hates all of his teammates and hits .300/.400/.550 and I bet he makes the team a whole lot better than the nicest guy in the world who hits .270/.330/.450. Not that the Reds can afford player A, but heck, they don’t even try for player B either. They tend to go with (sans Scott Rolen) player C who is a ‘winner’ who hits .240/.300/.350. Masterful weave of humor, opinion, and facts. I was thinking about the Cairo signing yesterday. It is kind of like when they had Juan Castro as a defensive specialist when the starter was brought in for his defense. If you have the “veteran presence” already in a starter’s role (Rolen & Cabrera) why do you need veteran presence on the bench? The bench player in a team with this makeup should be guys who can hit. Juan Castro was a much better player all around than Cairo. Even in a similar situation, Castro is make the most of his chance with the Phillies than Cairo is with the Reds. That goes to his natural ability.